Disclosure: We received a CleverPet Hub free of charge in exchange for an honest review. The following review is my personal opinion, and may not reflect that of CleverPet or any other individual. This post also contains Affiliate linkS, meaning that we will earn a small commission from purchases made through these links. Despite crooning “Don’t worry, sweetie! I’ll be back! I need to go to work so I can buy you a car, and a yard, and all the food and treats your heart desires,” Henry would still whine and pace when I left in the morning. I felt terrible. Here was my smart pup, who relishes puzzles and trick training, cooped up alone. I left Kongs stuffed with frozen food and switched on the radio before I left, but those would only placate him for so long. Because a second dog is not in the cards at the moment, I knew I needed to do something, but daily dog walkers or day care were simply not in my budget. Enter CleverPet. The CleverPet Hub is a smart device that syncs over your WiFi to an app on your phone. Designed by neuroscientists who love animals, it engages and rewards your dog using a series of “challenges”. How does it work? Each CleverPet Hub has three touch pads at the front of the device that light up in different patterns depending on the challenge. 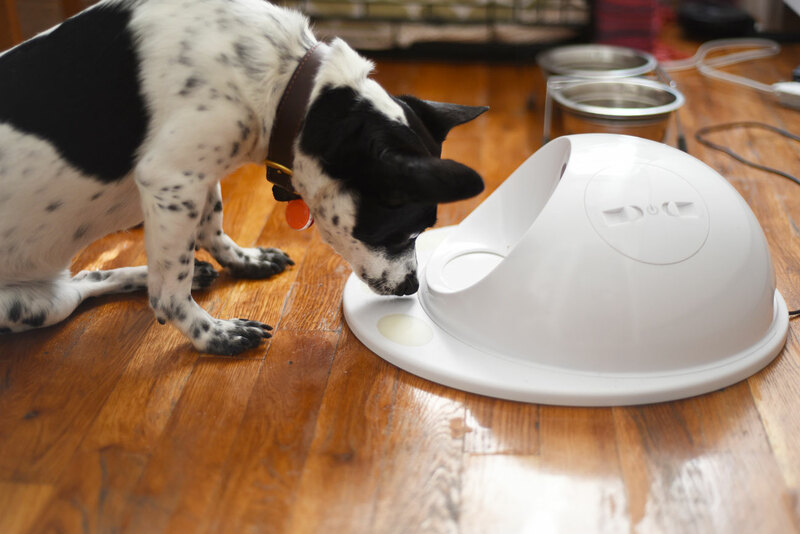 When your dog completes the challenge successfully, a tray swivels out to reveal a treat or kibble that your dog can eat. The challenges range from easy at first (touch any of the pads!) to complicated, Simon-like tasks. Would Henry take to this newfangled contraption? Would he love it so much that he would count down the hours until I finally left in the morning so he could get to his own “work”? I was eager to find out. The CleverPet Hub was easy to set up with very clear and concise instructions. These directions not only taught me how to make the Hub start up, but also walked me through the different parts. Stickers on the device coordinated with instructions on the start-up guide — it doesn’t get any easier than than! Plus, knowing the parts helped immensely when I needed to troubleshoot a few weeks later: instead of calling customer service and sobbing into the phone in confusion while Henry rolled his eyes, I confidently referred back to the initial setup and figured out the solution on my own. It took about three days for Henry to really catch on. At first, I tried to teach him by pointing and gesturing towards the lit touch pad, but discovered that he learned more quickly when he figured it out on his own. The whole scenario reminded me of my seventh-grade troubles with algebra homework: no matter how many times my dad would try to explain it to me, I just couldn’t grasp it until it miraculously clicked. PRO TIP: Use smelly, extra-delicious treats instead of kibble while your dog is learning the ropes. It’s extra incentive! Be sure to use treats that won’t crumble — I found that Zuke’s Mini Naturals work perfectly. 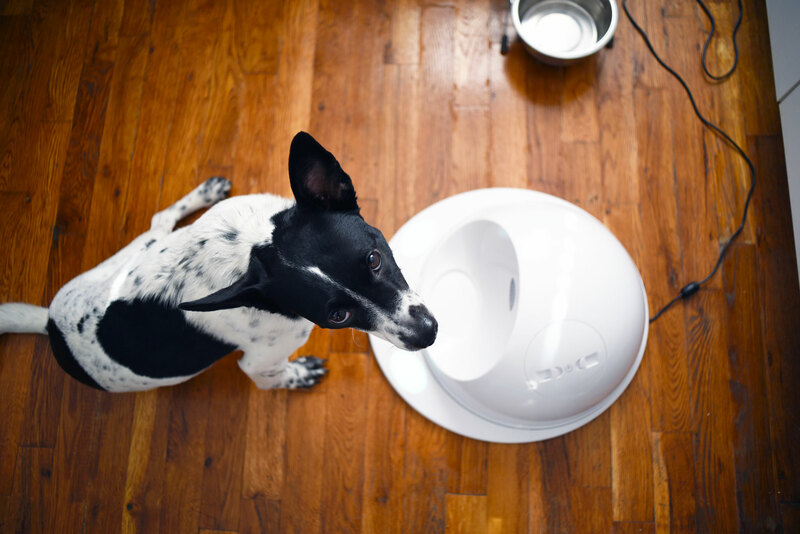 As such an advanced piece of technology, the CleverPet isn’t cheap – one will run you $299. If you think about the costs of dog walkers and daycare, however, it’s a positive bargain! Consider your individual needs, but it may be totally worth the investment to keep your pup happy and occupied. (Disclaimer: Of course, the CleverPet is not a substitute for a dog walker or daycare if you’re truly out of the house for long hours. It can be an excellent tool, but please attend to your dog’s needs). You going to leave so I can play? Once your dog masters a Challenge, the Hub will move to the next level. (If the new level proves to be too difficult, you can set it back.) Gone are the days of purchasing a brand new puzzle toy each time your dog learns the trick two minutes after unwrapping it: the CleverPet’s challenges morph and evolve based on your dog’s skills. The CleverPet app has built-in analytics so you can learn more about your pup’s play and learning habits. It also gives you starts regarding how many times he’s played that day and how many kibbles he’s eaten. The CleverPet comes with an engagement guarantee: If your dog doesn’t engage with the toy after thirty days, CleverPet will give you a full refund. I feel absolutely, positively terrible when I leave Henry at home or when I need to spend my evenings working on the blog or my Etsy shop. Although Henry seems content to snooze by my side (and I know he’s better off than he was in the pound), I can’t help but feel bad that I don’t spend every free moment playing with him. 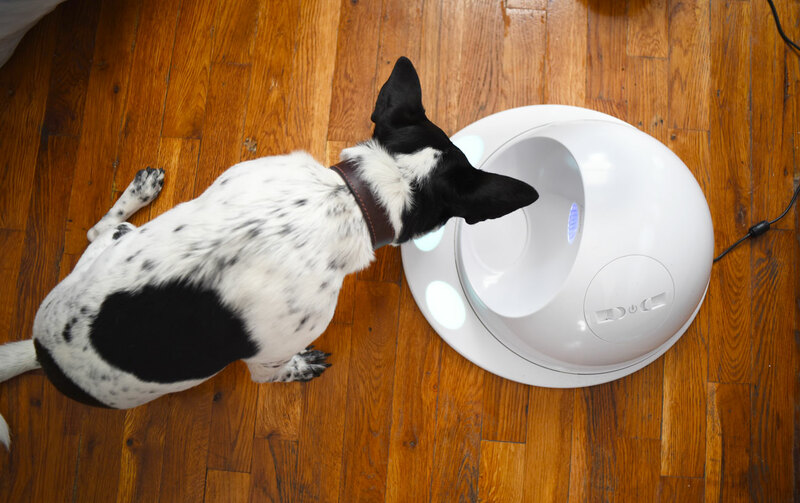 The CleverPet is the perfect solution: while I’m working, Henry trots over the kitchen and starts activating the touch pads when he feels like playing. When he wants a break, he takes a nap. It’s in his hands (er…paws?) and he has options! The first week we had the CleverPet, Henry escaped his pen six times. SIX TIMES. This is a dog who had never attempted an escape before. I’m thoroughly convinced that the CleverPet activated some crazy, underutilized problem-solving skills in his little terrier brain. Mind you, I actually reinforced the pen each day with some added security feature — and, each day, he foiled my attempts. I eventually had to reconfigure the pen setup so he now has access to half of the apartment instead of half a room (we live in a studio), including the bed — which I’m pretty sure was his intention all along. We’ve also been working on Henry’s Intermediate Trick Dog title, and I noticed that he has been learning new tricks much more quickly. Roll a soccer ball? Took him two minutes to learn. Put his paws up on my arm? Probably four tries. I’m amazed — he’s always been a smart boy, but after using the CleverPet, he seemed to catch on immediately. 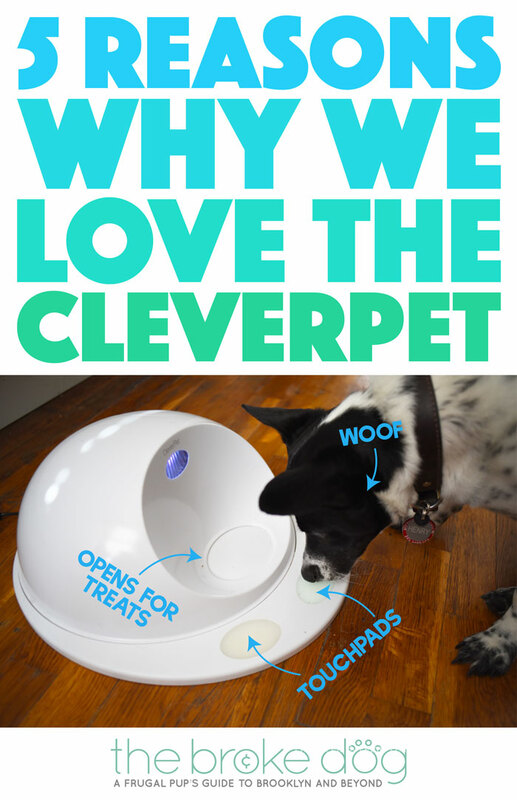 Did The CleverPet Solve Our Problem? The CleverPet didn’t end up solving the problem I had in mind (at no fault of its own! ), but it’s been an excellent tool in our household and has improved Henry’s mind and mood. Although the cost might be prohibitive for some, it is much more affordable than day care or dog walkers and, in our opinion, is absolutely worth it. Where Can I Buy The CleverPet? You can order from CleverPet’s website or from Amazon! For more information, check out CleverPet’s Facebook, Twitter, Instagram, and YouTube channel. So you’re observing the same thing with the device that I saw when I started clicker training–it makes dogs smarter to be rewarding for solving puzzles. Very clever. Ha!! I wish! We do clicker training as well, which has definitely also improved his training. I was cracking up to read that Henry was snoozing all day anyway, and playing with the CleverPet when you got back from work!! I very much suspect that my Golden would do the same, ha ha! I still think the CleverPet is super cool regardless though. Has Henry gotten through all the challenges yet ? My dog, Sherlock, has breezed through to challenge 10 in about 2 weeks and Im not sure what happens when he masters the last challenge. Does it become a very expensive doorstop? I guess the dog just keeps playing the final challenge? This seems like a really cool product that my foodie pup would enjoy. However, I’ve been looking all around the web trying to find any for sale with no luck. On their website even the refurbished ones are out of stock for quite some time now. Do you know if they are still selling these? Hi Irene! It seems like some other folks are having a hard time too. I’m not sure what the story is but I hope they come back soon!